Now that summer is over, horror hounds are looking forward to the Halloween season, which, for many fans, means revisiting their favorite horror franchises in celebration of this spooky holiday. One inventive YouTuber decided to kick off autumn by cutting together a fan trailer that pits Jason Voorhees from the Friday the 13th franchise against Michael Myers from the Halloween series. The results is a blend of great scenes from both franchises along with some inventive special effects to bring these sadistic killers together. The video was edited by a YouTuber named stryderHD, whose work we showcased back in late June with his Ghost Rider vs. Spawn fan-made trailer. The video features clips from Halloween, Halloween 2, Halloween 4: The Return of Michael Myers, Halloween 5, Halloween: The Curse of Michael Myers and Halloween: H20 for the Michael Myers character. For the Jason Voorhees scenes, stryderHD used Friday the 13th, Friday the 13th Part II, Friday the 13th Part III, Friday the 13th: The Final Chapter, Friday the 13th: A New Beginning and a Jason vs Michael Fan Film by Trent Duncan, which portrays some key scenes towards the end of the trailer that wouldn't be possible even with the most clever editing techniques. The video also features an homage to Moustapha Akkad, the producer who helped shepherd John Carpenter's original horror classic Halloween in 1978, and most of its subsequent sequels. The trailer reveals that this fan film is "from" Moustapha Akkad, paying tribute to the producer, who passed away in 2005 due to injuries suffered during a terrorist attack in Jordan. Since then, Moustapha's son Malek Akkad has taken over shepherding the franchise, with this trailer coming just as Malek Akkad's producing partner on the new Halloween reboot, Jason Blum, promises that the movie will be in theaters next October, or fans can chop off his hand. So, while it seems that we'll be seeing a new Michael Myers on the big screen next year, the same most likely can't be said for Jason Voorhees. After the 2009 Friday the 13th reboot, which starred Derek Mears as Jason Voorhees, production company Platinum Dunes has been trying to reboot the franchise again, without much luck. We reported in February that Paramount had completely shut down their Friday the 13th reboot, with insiders claiming that the dismal box office results of the studio's Rings reboot was one of the primary factors in shutting down a new Jason Voorhees movie. Paramount had been planning on starting production this spring on the F13 reboot, but now the project seems as dead as Jason's victims, although perhaps one day someone can truly bring this franchise back from the dead. Along with scenes from several of the original Friday the 13th and Halloween movies, the video also includes audio excerpts from the original Halloween theme, music from the recut Friday the 13th: Part V teaser, modernized trailer music from the first three Halloween movies and the Halloween 2 modern trailer music. Unfortunately, it seems highly unlikely that we'll get to see both of these iconic characters square off on the big screen. 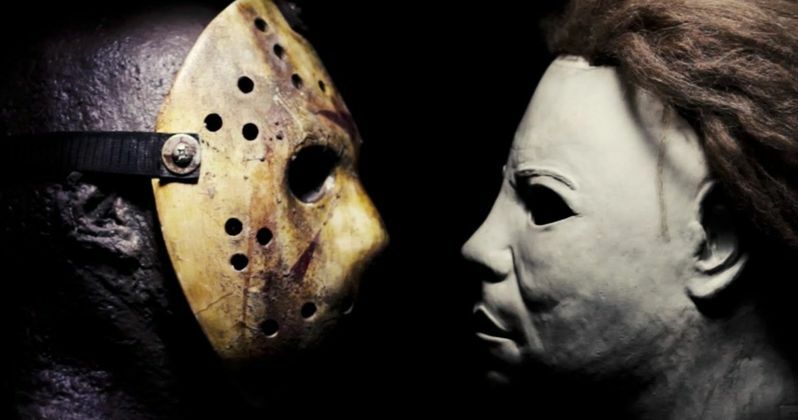 Still, fans can enjoy this clash of the horror titans in this Jason vs. Michael fan trailer below.